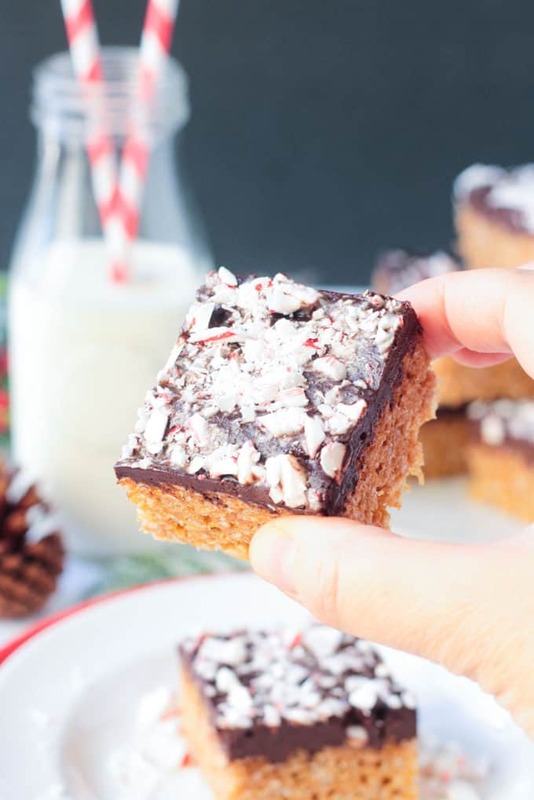 Chocolate Peppermint Rice Crispy Bars – Crunchy cereal bars with lots of chocolate and a subtle peppermint flavor. They taste like your favorite peppermint mocha. I have created our go-to holiday treats! And they are guaranteed to be yours too! They are similar to the Rice Krispie treats you know and love, but slightly healthier and with a chocolate peppermint flavor to up the ante. 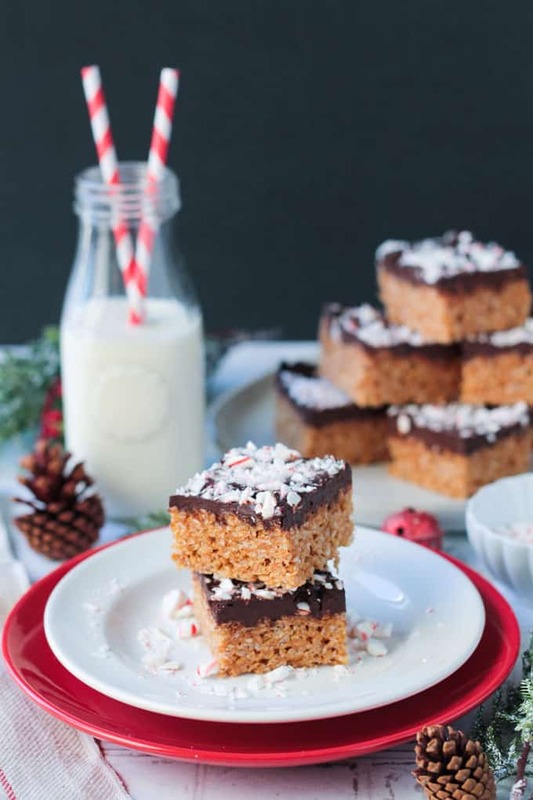 Chocolate Peppermint Rice Crispy Bars! My husband loves peppermint. He eats candy canes like they are, well, candy. And his most favorite Christmastime treat is Peppermint Ice Cream. I do not share his love for peppermint, however, I know its a staple flavor around the holidays so I wanted to create a recipe for the blog that I knew would be a big hit with others…and hubby, of course. If you’re not a peppermint lover either, you might want to try my Brown Rice Crispy Treats w/ Strawberries instead. BUT, as luck would have it, I actually loved the peppermint meets chocolate flavor (I kind of can’t stop eating them!) 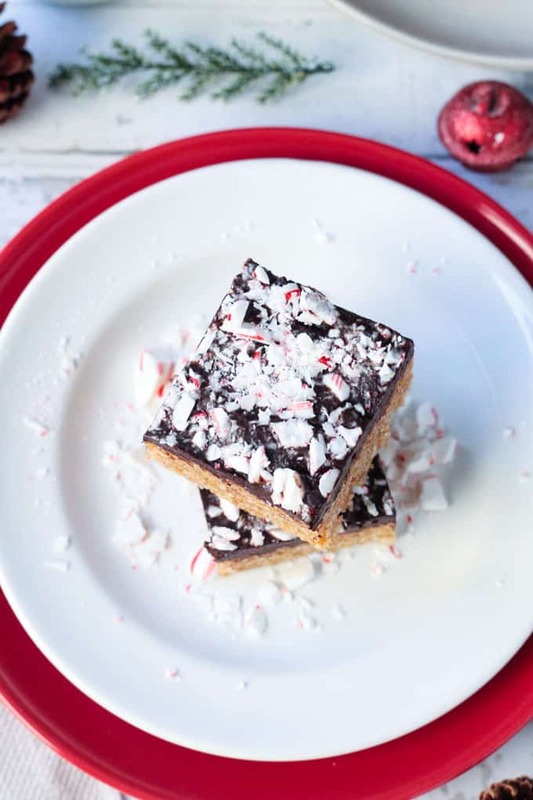 – so even if peppermint is usually not your thing, you might just find you love these rice crispy bars anyway! These Chocolate Peppermint Rice Crispy Bars actually remind me of the flavors of that wonderful peppermint mocha. They’re addictive really. 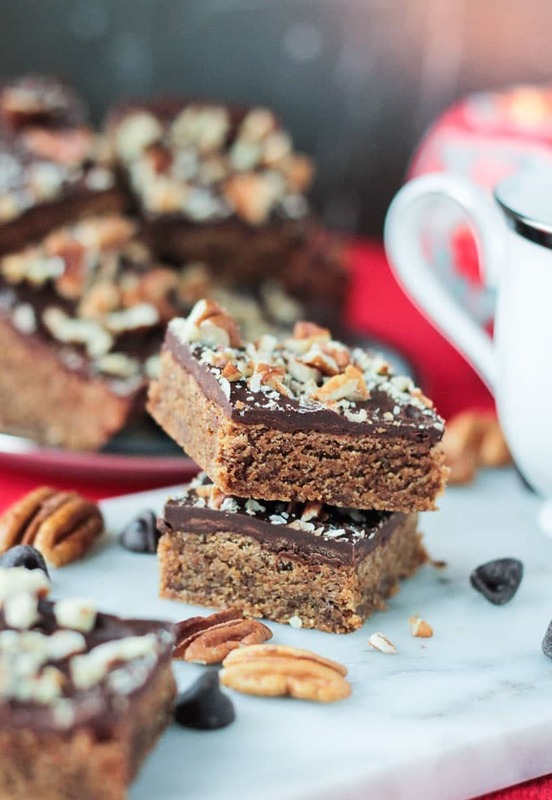 You have to try these chocolatey minty crunchy bars. I can’t stop eating them…and I don’t like peppermint, remember? They are soooo good! 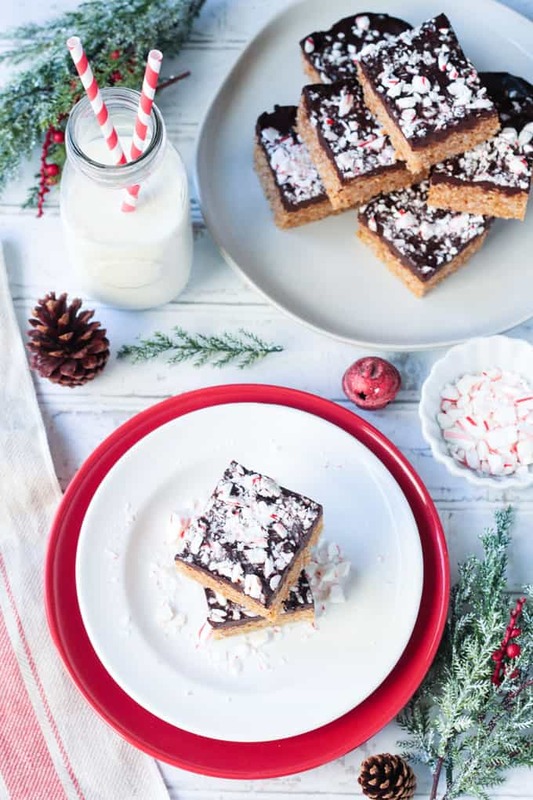 These crispy bars would be delicious any time of year, but top them off with some crushed candy canes and they instantly become a festive holiday treat! 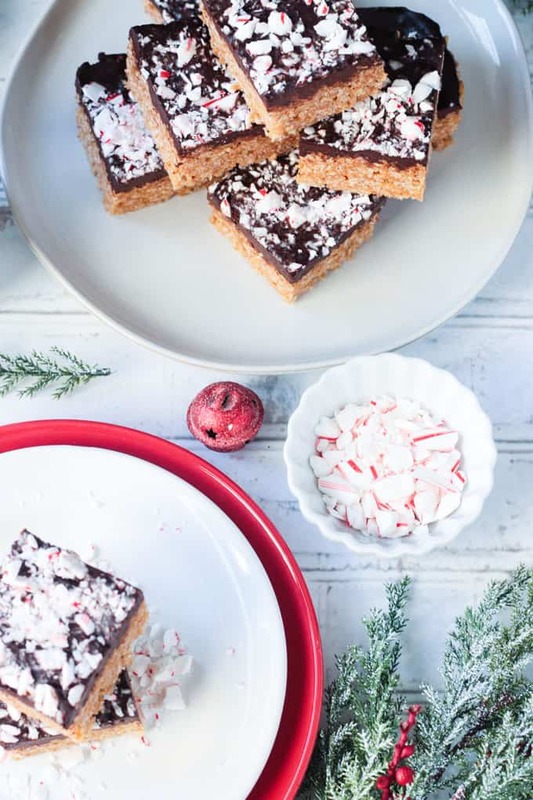 I hope you love these Chocolate Peppermint Rice Crispy Bars as much as we do. If you try them, please come back and leave me a comment below with your feedback and star rating. You can also find me on social media. Be sure to tag @veggie_inspired and #veggieinspired so I’m sure to see it. 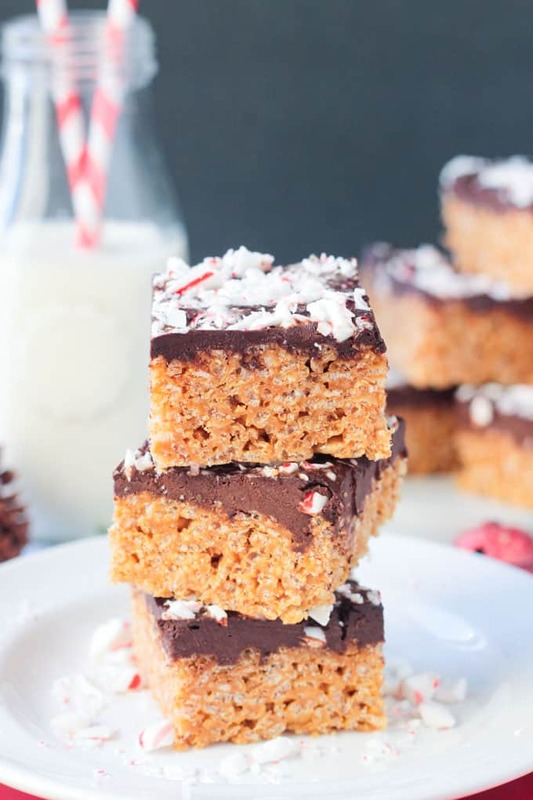 Crunchy cereal bars with lots of chocolate and a subtle peppermint flavor. They taste like your favorite peppermint mocha. In a pot on stovetop, combine 1/2 cup cashew butter, brown rice syrup, vanilla extract, 1 tsp peppermint extract and powdered sugar. Whisk over medium-low heat until smooth. Pour cashew butter/brown rice syrup mixture over the cereal in a large bowl and mix well so that every bit of cereal is covered. Spread out in an 8x8 baking pan lined with parchment (make the parchment long enough so you have "handles" to lift out the whole square of bars once they are done). Put pan in fridge for 30 minutes to set. For the Chocolate Peppermint Ganache Topping: Combine 1 cup chocolate chips, almond milk and 1 tsp peppermint extract in a pot on the stove. Whisk until smooth. If the ganache is too thick, add more milk 1 tbsp at a time until desired consistency is reached. Take cereal bars out of fridge and pour the ganache on top, spreading it out evenly over the bars. Put back in fridge for at least another 30 minutes until ganache topping is set. Sprinkle crushed peppermint candy canes over the top. ~To crush candy canes, place them in a plastic Ziploc-type bag, squeeze the air out of the bag, and close. Using a rolling pin or other heavy utensil, bang on the candy canes until crushed. The kids would probably love to help you with this! Content and photos updated December 2017. Original posted December 2014. This looks like an awesome recipe, excited! 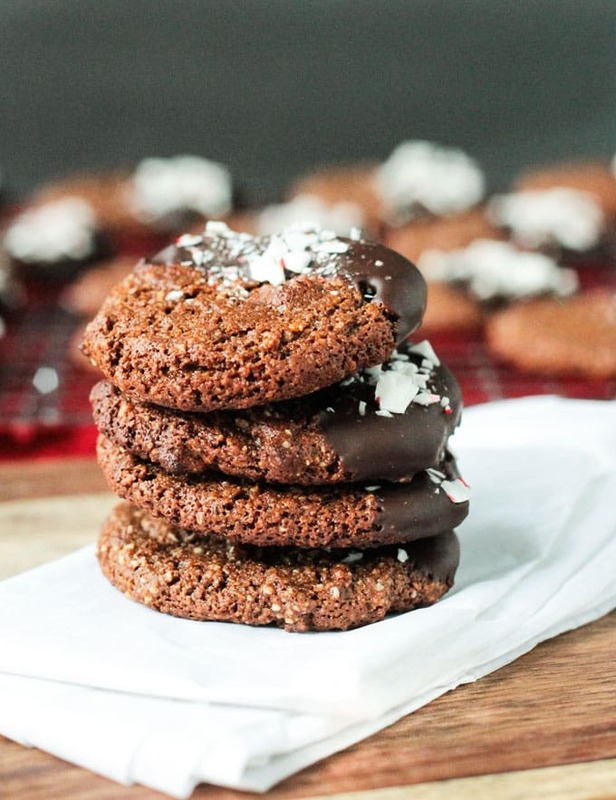 We have an 8 year old granddaughter that can’t have gluten, artificial flavoring or colors, soy, dairy and refined sugar so I’ve been searching for holiday treat recipes that I can make so she’s not left out at Christmas, I think she’ll love these! I do have a question though, will these keep making them a couple of days in advance? Hi, Connie! Glad you found this recipe. Though I’m not sure you’ll find any chocolate chips that are made without refined sugar – not sure about that. I find these are best on the day of, but we have kept them for a few days before. They’ll still be good, but they do lose a tiny bit of that initial crispness. Enjoy! Thank you! 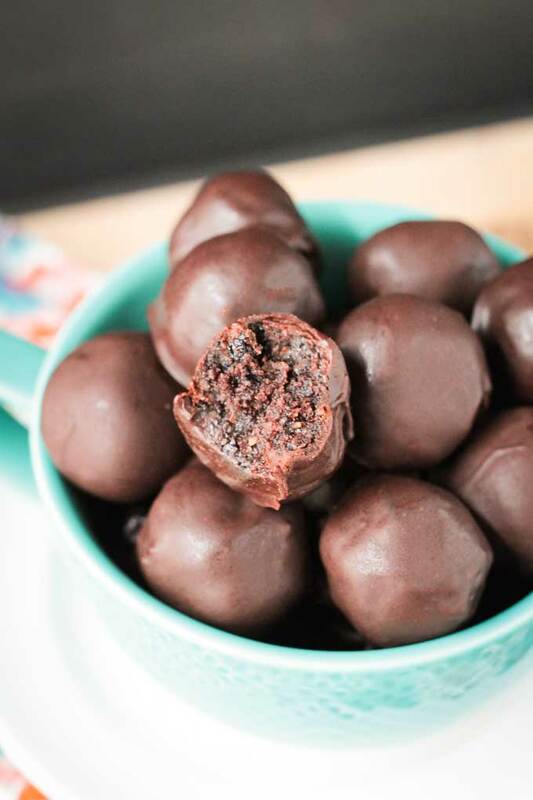 I did make them and used Enjoy Life brand dark chocolate chips which are really low in sugar which works out ok with her dietary restrictions since they’re at least dairy, gluten and soy free with just a little bit of sugar. These were so easy to make and a hit with everyone, even those without dietary restrictions lol. Thank you so much for sharing this recipe! Oh, that’s great! So happy to hear it worked out and everyone loved them! Thanks, Connie! I am like your husband and love chocolate and peppermint together–just not plain candy canes. These treats look great and I love that they are marshmallow free. I could never tolerate the straight peppermint like he does. But with chocolate – oh yes! 🙂 Thanks, Kristen! This is a fabulous flavor combination for Krispie treats. Plus they are healthier – a win/win! This is so lovely my students will love this kind of treats . I shall make this as take away for my pre christmas party.. I hope they love them! Thanks, Helene! I LOVE the look of these, especially with the peppermint candy on top! Thank you! They’re so fun for the holidays! 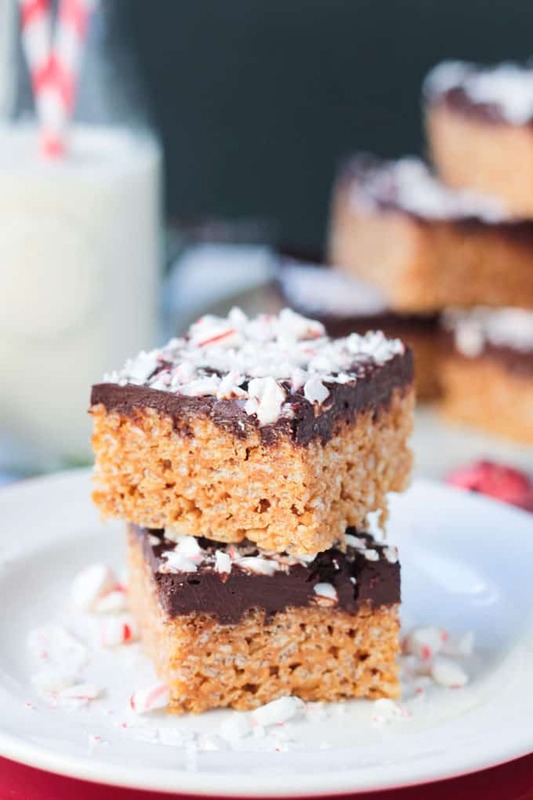 Great use of candy cane, love the crunchy topping. This is sure to be a winner with the family this Christmas. Great recipe to get the kids involved with. Thanks, Claire! It’s definitely a festive favorite! Ah I was just thinking about rice crispies bars the other day! You must have read my mind… love the peppermint combo! Thanks! I’ve got you covered, girl! 🙂 Let me know if you give them a try! What a great twist to rice krispys! I have got to make them next time! I made a batch last night for our neighborhood holiday party and everyone loved them! Let me know if you try them, Kristina! I can taste the amazingness now! I’l have to add these into rotation this year. As soon as December hits, I’ve gotta have mint chocolate everything. This dessert will win with adults and kids!!! Perfect! These will definitely please the entire crowd! Oh my goodness!!! De-e-elicious festivities are over at your house then! Yummy! Come on over, Trinity! The more, the merrier!! 🙂 Thank you! Thanks! I have devoured (with the help of my kids) 2 batches already!